I finished planing two reference faces on each stile. Next I’ll bring them to final width and thickness. Almost forgot…in case you didn’t know, fine shavings will stick to your automobile. When I turned around, the entire side of my mighty Taurus was cloaked in shavings. By the time I reached for the camera, they fell off…you’ll have to take my word for it. P.S. I ordered a new plow plane today…excited! 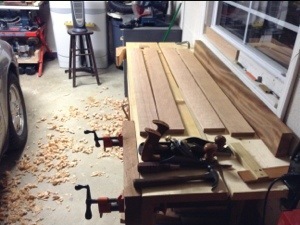 This entry was posted in Chiffonier, hand tools, woodworking and tagged chiffonier, hand tools, reference faces, Stiles, wood shavings, woodworking by villagecustomfurniture. Bookmark the permalink.